It isn’t a New Year holiday yet, but how about to add something eye-catching and sparkling to your everyday looks? I’m sure you will love our ideas that we have prepared for you. Today I want to share with you good looking outfits with glitter boots that will be glamorous items, for sure. 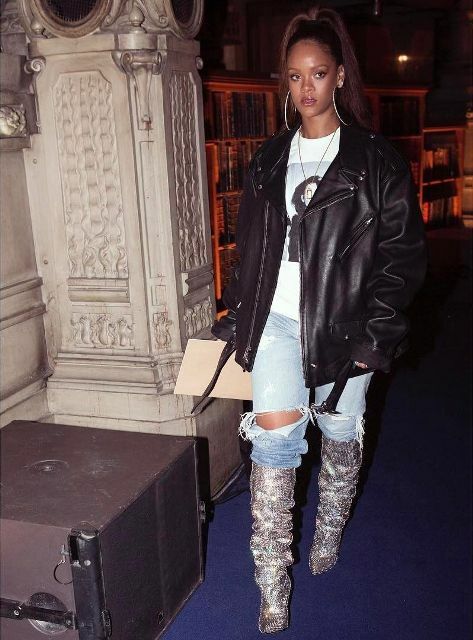 You can choose any type of boots, for example, for creating a casual outfit you can take low heeled ankle boots or if you want to make a cocktail party look then you can pick up high heeled ankle or high boots. You can combine them with neutral colored pieces of clothes and accessories, but, of course, if you wanna look more gorgeous, then you can mix them with printed or embellished items. So don’t waste your time and scroll down to consider all ideas. Enjoy! If you love bright colored accents, then you can pair a black shirt with black crop pants, a navy blue long blazer, sunglasses, a black leather chain strap mini bag and hot pink glitter low heeled ankle boots. Or try to repeat a combination with a plaid oversized blazer, a black velvet clutch, cuffed skinny jeans and emerald glitter sock boots. For colder days you can create a comfy and cozy look with a long t-shirt, a beige knitted cardigan, a beige scarf, a printed tote, distressed jeans and silver glitter ankle boots. Don’t be afraid to mix elegant items with such sparkling shoes. 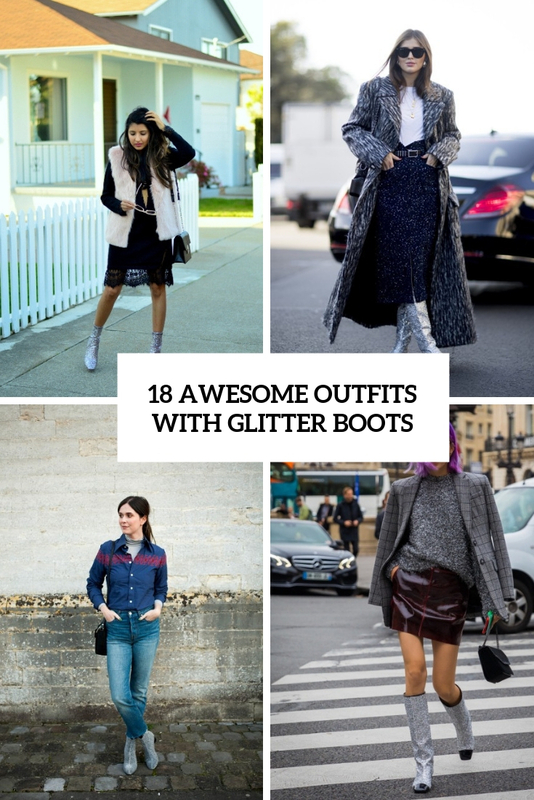 For example, you can take a gray loose sweater and combine it with a marsala patent leather mini skirt, a gray plaid blazer, a black mini bag and glitter high boots. Or you can choose a pale pink turtleneck and pair it with a classic plaid dress, glitter flat boots and a black leather mini coat.